The main purpose of my visit however was to see a Leadership and Entrepreneurship Training Ourprogramme that had been part of the original English teacher training proposal. We had wanted the most enterprising 30 selected, and the Bureau of the Commissioner General had chosen 25 youngsters from each of the four centres still open in Vavuniya. 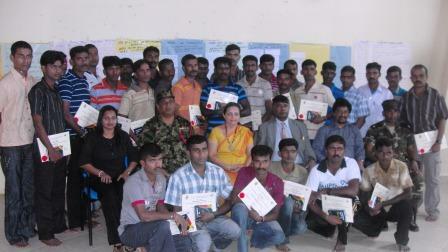 These all had a familiarization programme on the Saturday, and then 30 of these were chosen. The Commissioner General’s staff told me that the programme coordinators had selected about 80 of those they had earmarked as capable. The boys who were involved in the programme were certainly of a high caliber. By the time I got there, they were working in groups on Business Plans, and I was impressed by their commitment, and the intelligent analyses that accompanied their presentations. Interestingly, in line with suggestions we had made earlier, when I implemented a Confidence Building and Stabilization Measures project, the boys had chosen two projects to do with construction, and two in agri-business. 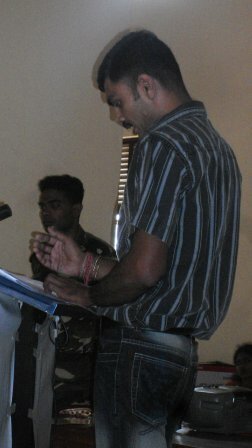 The evaluations were a tribute to Business Consultancy Services which conducted the programme. To quote from an eloquent thank you speech – these were delivered in English as well as in Tamil and Sinhala – ‘Our training programme called EDT (Entrepreneur Development Trianing) has taught us very hard things in simple ways…Though this is a seven days programme, we worked till midnight. We think this is a 14 days programme’. What was more heartening was the conviction, ‘If not now, some other day we are confident we will be able to run a successful business outside, using the lessons learnt here.’ Given the skills in evidence, I hope very much that we will be able to develop an environment conducive to entrepreneurship in these areas. We need in general to get rid of the culture of dependence that state handouts and the economic policies of the first few decades after independence encouraged. These youngsters, having experienced harsh controls in their youth, are not likely to want further dependence. They will be happy if the state provides the required infrastructure, as is now happening, and facilitates credit so they can then operate on their own. The fact that they have selected business propositions appropriate to the areas in which they will live suggests that they will be active partners in developing a prosperous country. Hearteningly, I found the officers looking after them extremely concerned about their welfare. One of them insisted that I see the handicrafts that were being prepared for the Deyata Kirula exhibition that will be held at Buttala next month, and asked if an Exhibition of the work could be arranged in Colombo. It was suggested that one of the former welfare centres be used for a Cooperative Farm, and this would certainly be good use of land that might otherwise swiftly revert to jungle. A year ago, when I had visited the same camp for Thai Pongal, it had been a centre for girls, over 1000 I believe, all looked after by a Captain who seemed younger than her charges. It was hard to think that almost all those girls had now gone home, though I was happy to note that some of them returned to one of the other camps for a Montessori course. All in all, the exercise seems a more successful Rehabilitation Programme than any conducted anywhere else in the world for former terrorists. The alienation produced by the Tiger system of recruitment may have helped, since many of these youngsters had been forcibly conscripted. But the confidence they have now reposed in us should be honoured, and we must ensure a sustained programme of reintegration over the next few years, to ensure they fulfil the potential that was so nearly ruined. Ø The training conducted by BCS has changed us a lot as we are undergoing rehabilitation. Ø When we were called in for the interview, we were pessimistic that this too will be like the previous training programs, which we have undergone. Ø When we got selected and completed the first day in class we were optimistic that this is something new and useful for us. Ø Our training programme called EDT (Entrepreneur Development Training) has taught us very hard things in simple ways. Through games, visuals, experiences and practicals. Ø This made everyone understandable, each and every minute was useful to us. Ø Though this is a seven days programme, we worked till midnight. We think this as a 14 days programme. Ø Previously we didn’t have any knowledge on running a business. After the training we believe that we have necessary knowledge on production, marketing, management, strategies and techniques. Ø If not now, some other day we are confident we will be able to run a successful business outside using the lessons learnt here. Ø Cause for the change in us are the trainers who have contributed their precious time and knowledge shaping us up. Ø We are always thankful to the ladies and gentlemen who have come here open heartedly in between their busy schedules. Dr Sarath Buddhadasa, Madam Wanduragala, Dr Rohana Kuruppu, Prof and Member of Parliament Rajiva Wijesinha, , Mr Ariyadasa, Ms Subani, Mr Shakthi and Mr Mohammed. Thank you everyone for giving us this wonderful opportunity.